Pre-shaped High Density Memory Foam knee & hip pads, plus knee sliders. Keprotec® panels above knee and up inside thigh for flex. 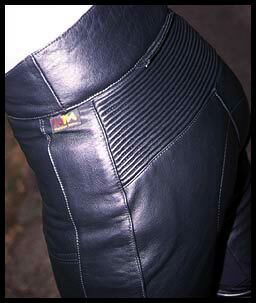 Extra soft leather behind knees to reduce bunch up. Adjustable waist closure, zip at back to attach jacket. Elasticised leather panel across back.